Watch out, Ryzen: Coffee Lake is here, and it means business. Coffee Lake is Intel's biggest jump in generational performance in more than a decade, and the i7-8700K is the new king. I still remember the first time I used a hex-core processor. It was in early 2012, and I got to test a high-end desktop from a system builder. My own PC at the time had an i7-920 'Bloomfield' processor overclocked to 3.2GHz, and I thought it was pretty potent (I still have that PC kicking around today). Going from a quad-core system to a 6-core PC, complete with liquid cooling and a healthy 4.5GHz overclock, delivered a knockout blow to my poor system. It was very nearly twice as fast in many benchmarks. I lead off with that anecdote because, almost six years later, Intel is finally getting around to releasing a 6-core processor for its mainstream platform. And let's be frank, this is all thanks to AMD bringing competition back to the CPU market with Ryzen. Going up against a company like Intel is often a thankless job, and AMD's CPUs have struggled for much of the past decade to keep up with Intel's best processors. Ryzen isn't always faster than Core i5/i7, but it's definitely a threat, particularly outside of gaming. Intel isn't going down without a fight. The last time AMD had a clear lead in the CPU realm was in the Pentium 4 vs. Athlon 64 days, and from 2003-2006 AMD laid claim to the CPU throne. It took time for Intel to correct its course, but the result was devastating. The Core 2 Duo came out in July 2006, and it delivered significantly faster performance than anything AMD had to offer while generally using less power. 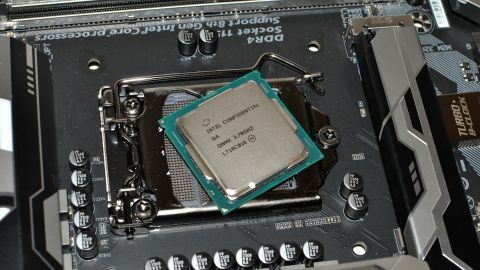 Core 2 Duo also ushered in the tick-tock era for Intel, where new processor architectures started coming on a yearly schedule, and from 2006 onward Intel has reigned as the CPU champion. If you feel Intel has been coasting for the past several CPU generations, you're not alone. We would have had something like Coffee Lake three or four years ago if AMD's Bulldozer family of processors had been more competitive. Better late than never, and Ryzen has effectively forced Intel to move 6-core down from the enthusiast sector and into the mainstream. So again, thanks AMD! It's not just the halo products getting a much-needed boost in core/thread counts either. With Intel's 8th Gen Core desktop processors, Core i7 moves to 6C12T (6-cores/12-threads), Core i5 goes to 6C6T, and Core i3 becomes 4C4T. Or another way of looking at things is that the new Core i3 parts are almost the same as the previous generation Core i5 parts (but without Turbo Boost). Intel hasn't officially revealed specs for the next generation Pentium and Celeron parts, but Kaby Lake Pentiums already moved into Core i3's 2C4T territory, and will likely stay there for now. Prices do creep up slightly on some of the performance tiers, so the i7-8700K checks in at $359 compared to the outgoing i7-7700K's official price of $350, and the i5-8600K is $257 compared to $243 on the i5-7600K—and that's still without any sort of included cooler. But considering we're getting 50 percent more cores, and clockspeeds are slightly higher in most cases, the small price premium isn't a major concern. The Core i5-8400 is potentially the most interesting of the current crop, as it's priced to move at just $182—and Intel knows it, which is why it sent along that chip for the launch party rather than the usual unlocked K-series part. I'll have a separate review of the i5-8400 up later today, but you can see the performance in the charts that follow. For all the good things about Coffee Lake, there is at least one fly in the ointment, and that's the chipset/motherboard requirements. Coffee Lake uses the same LGA1151 socket as Kaby Lake and Skylake, but it requires a new 300-series chipset (currently only Z370). That Z270 motherboard you purchased earlier this year? Yeah, tough luck—despite earlier rumors that Coffee Lake would work in existing motherboards, that didn't actually pan out. For all the hand wringing about planned obsolescence and the chipset/motherboard update, the reality is very few people buy a new CPU for an existing system. Yes, enthusiasts do it quite often, but we're a small fraction of the market. More often people who want a new PC are upgrading from something at least five years old, and they're not planning on bringing any parts along—the kids or eBay can take the old rig. If you recently upgraded to Skylake, Kaby Lake, or Ryzen (or any of the enthusiast CPUs like Haswell-E, Broadwell-E, Skylake-X, or Threadripper), don't sweat it. Coffee Lake is new and it's exciting, but it won't inherently make existing PCs obsolete. That's because architecturally, Coffee Lake doesn't really change anything that I can see from the existing Kaby Lake designs. Where before there were up to four cores and 8MB of L3 cache, with an HD Graphics 630 solution, now there are six cores and 12MB L3 cache, and the same HD Graphics 630. Core i5 parts also disable 1MB of L3 for each pair of cores, just like the previous Core i5 desktop parts. So whether you're on Core i7 or Core i5, Coffee Lake delivers a 50 percent increase in the most important CPU elements. The left third of the die is still devoted to the integrated graphics. That doesn't mean Coffee Lake is just a recycled design. Intel already has 6C12T parts with Skylake-X and the i7-7800X, but that's a 10C20T die with four cores disabled. Skylake-X also uses Intel's new mesh topology in place of the previous ring bus, which increases latencies in some cases. For Coffee Lake, Intel has created a new 6C12T die with a dual-channel memory controller. Intel doesn't specifically state that Coffee Lake uses a ring bus, but that's my guess—and performance supports that assumption. Which brings us to the core [sorry, couldn't resist] of this review. You can see the full list of test platforms above and to the right, and along with the processor we have a new motherboard for our Coffee Lake build. Gigabyte sent an Aorus Z370 Gaming 7 motherboard, a high-end design that includes plenty of bells and whistles. In addition to the usual stuff like SATA ports and the chipset, the motherboard includes premium audio, three M.2 slots for NVMe storage, and there's even a little fan hiding beneath the IO shroud. I used the F4a BIOS revision for this initial review. All test systems use fast DDR4-3200 memory to provide optimal performance, with M.2 NVMe SSD storage for the OS and applications, and games stored on a large 2TB SATA SSD as a secondary drive. Nvidia's GeForce GTX 1080 Ti Founders Edition graphics card was selected to help differentiate the CPUs, with the chosen resolution of 1920x1080 at ultra/maximum quality settings. Even at 1080p ultra, however, there are some games that still end up GPU limited. Testing at 4K instead of 1080p would be less meaningful for CPU comparisons, as the graphics card becomes the limiting factor—look at the graphs for The Witcher 3, and to a lesser extent The Division and Ghost Recon: Wildlands to see what I'm talking about. What exactly do you get from two additional cores and four more threads? You get something that looks a lot like one of the Intel's previous 6C12T 'enthusiast' CPUs, only with lower power requirements and a lower entry price. If you already have an i7-5820K, i7-5930K, i7-6800K, or i7-6850K, you're most of the way there, just without a few of the enhanced architecture aspects like AVX512 and a 6-wide superscalar design. Since we're PC Gamer, and this isn't some insanely expensive CPU that's primarily intended for professionals, I'm going to kick off the performance results with gaming this time. Coffee Lake is on the other side of the performance scale compared to the insane 18C36T Core i9-7980XE. It has one-third as many cores, yes, but it also uses about one-third the power, and it costs less than one-fifth as much. While the fastest Skylake-X parts excel at CPU-intensive tasks including video editing, software compilation, 3D modeling, and various professional applications, the i7-8700K is no slouch in those areas, and it takes top honors in our gaming suite. Of the 15 games tested, it ranks first in all but two games, and even when it loses it's not too far behind. What's particularly interesting is how large the gap is in a few games. Civilization VI for example scales with CPU cores on AMD's Ryzen chips, but the previously tested Intel CPUs seem to hit a bit of a wall around 75 fps. The i7-8700K blows past that mark, reaching 86.6 fps at stock and 96 fps when overclocked. Dawn of War 3, Dishonored 2, and Mass Effect: Andromeda also show moderate scaling with faster processors, though there are clearly diminishing returns—and these would be even smaller with a slower GPU or a higher resolution. Overall, framerates improve by around seven percent compared to the i7-7700K. That's a bit surprising, really, since many other CPUs including the various Core i9 models don't usually show much benefit compared to the i7-7700K. I mentioned earlier that Skylake-X uses a mesh topology for communication between the processor elements (IO blocks, CPU cores, L3 cache, and memory), while Kaby Lake and most likely Coffee Lake use a ring bus. Combined with the larger L3 cache, this results in lower overall latencies for many operations, and games in particular tend to benefit from such architectural designs. Something else to consider is that Threadripper and Skylake-X both support quad-channel memory, but two of the memory channels have higher latencies, which can negatively impact performance for some applications. If you don't need the extra memory bandwidth, a dual-channel memory controller can be the faster solution. What about for non-gaming purposes—how does Coffee Lake stack up in CPU intensive workloads? Obviously, for applications that can scale up to 18 cores, the i7-8700K is going to come up short, but in moderate workloads it can still pull ahead. There's also the question of how much you really need the additional performance that a 16-core chip provides. If you only do periodic video editing as an example, doubling your performance a couple times each month may not matter much. Here's a look at Coffee Lake running CPU-centric workloads. Even with one-third as many cores, the i7-8700K still provides more than half of the performance of the i9-7980XE. That's because it can run all six cores at 4.3GHz, pretty much all day long, where the 7980XE has to drop down to 3.4GHz (unless you overclock it). The high clockspeeds and higher performance architecture also push the i7-7800K ahead of all the AM4 Ryzen processors, though individual tests sometimes favor the Ryzen 7 chips. Meanwhile, applications that leverage AVX instructions—like the HWBOT x265 video encoding benchmark and y-cruncher—can heavily favor the Intel CPUs. When you consider the pricing of AMD's Ryzen CPUs, it becomes obvious why Intel had to produce some mainstream 6-core parts. Games may not scale much beyond 4-core still, but other applications can readily take as many cores as you can provide. AMD's Ryzen 5 1600X is a $220 part that's able to beat Intel's $350 i7-7700K, and the $240 i5-7600K falls well behind the $200 Ryzen 5 1600. Give the i5 two more cores, however, and the story changes. I'll get into this more in a separate review, but the i5-8400 ends up delivering performance very close to the i7-7700K, at slightly more than half the price—and it comes with a cooler as part of the price. Coffee Lake tilts the scale back toward Intel, particularly if you're also after higher gaming performance. I didn't have a ton of time to spend on overclocking the i7-8700K, but with very little effort I was able to reach a stable 4.8GHz on all six cores. That includes 4.8GHz when running AVX workloads, though in a few cases (y-cruncher) there's a bit of throttling due to temperatures. That may have been an issue with my cooling setup, but you'll want something better than just a basic air cooler if you're overclocking. One big complaint with Intel's past several generations of CPUs is that Intel switched to a far less desirable thermal interface material (TIM) with Skylake and Kaby Lake, and that continues with Coffee Lake. Wes used der8auer's Delid-Die-Mate 2 with an i7-7700K and was able to replace the TIM with a liquid metal compound, with the result being a drop of up to 20C in CPU intensive workloads—and that's without overclocking. With two extra cores, running at 4.8GHz is no mean feat, and my i7-8700K got above 90C. That's not a level I'm comfortable with running over extended times, though for shorter benchmarking sessions it's not likely to be a problem. And this is with a Corsair H115i liquid cooling solution, air cooling could prove even more problematic. Here's the interesting thing, though. The i7-8700K can run at up to 4.7GHz stock, on a single core, and 4.3GHz on all six cores. Normally, getting a chip to overclock involves pushing more voltage into the CPU, but the 8700K didn't need that and in fact the thermal limits made it counterproductive—at 4.9GHz with an extra 0.05V, for example, the CPU would hit 100C and throttle. After playing around with settings in Intel's Extreme Tuning Utility, I eventually determined that my best results were obtained with no additional voltage. So all I had to do was set the multiplier to 48 and I was good to go. Simple! Though of course other i7-8700K CPUs may do better/worse than my sample. But if you're hoping to hit 5.0GHz on all six cores, you'll want a good cooler and you might want to delid your processor. 2017 has easily been the most exciting year for the CPU industry that I can recall, with strong competition from AMD on all fronts. Intel has regained the upper hand with Coffee Lake for anyone looking to build a completely new PC, but we wouldn't even have Coffee Lake if it weren't for Ryzen. I mentioned Intel's tick-tock schedule for new CPUs earlier, a cadence that meant we could count on new parts every year. In recent times, Intel abandoned tick-tock for a new model: process, architecture, optimization. Applied retroactively, Broadwell at 14nm was the 'process,' Skylake was the 'architecture,' and Kaby Lake is the 'optimization.' With Moore's Law on its deathbed, Intel has now added a second optimization on the 14nm node in Coffee Lake. Who is Coffee Lake for? Like most new CPUs, it targets people building new systems more than piecemeal upgrades. If you've been holding on to a Sandy Bridge i7-2600K or even i5-2500K, waiting for a compelling reason to upgrade—and you weren't willing to move up to the X79/X99/X299 platforms—Coffee Lake may finally win you over. But if you're one of the many that saw AMD's Ryzen 7 parts earlier this year and decided to sacrifice a bit of individual core performance and clockspeeds in exchange for an 8C16T processor, Intel's counterstrike is already too late. Similarly, anyone who already owns a Skylake or Kaby Lake system likely won't find any compelling reason to upgrade just yet, especially since upgrading would mean buying a new motherboard as well as a processor. Let's end by putting things in perspective. Intel's first Core i7 processor was a 4-core/8-thread part, the i7-965 Extreme Edition, and it came to market nine years ago. Clockspeeds back in 2008 topped out at a modest 3.46GHz turbo, 3.2GHz base clock, and the mainstream i7-875K bumped the maximum turbo clock to 3.6GHz 18 months later. Since then, we've had the i7-2600K (3.8GHz), i7-2700K (3.9GHz), i7-3770K (3.9GHz), i7-4770K (3.9GHz), i7-4790K (4.4GHz), i7-5775C (3.7GHz), i7-6700K (4.2GHz), and i7-7700K (4.5GHz). Those were all the top mainstream Core i7 parts for each generation, and every single one of them is a 4C8T design. If you wanted more than that, you had to fork over the big bucks, and the result is that the mainstream CPU performance has only improved by around 50 percent over seven generations of Intel Core CPUs. Coffee Lake kicks the old Core i7 and Core i5 parts to the curb, boasting 50 percent more cores, with higher clockspeeds as a bonus. The most frustrating thing about Coffee Lake is that we know Intel could have released a 6C12T mainstream part any time in the past several years, but there was no competition forcing it to do so. Instead, anything more than 4C8T was reserved for the 'enthusiast' market, and the result is that CPU performance has been stagnating. Now that AMD is competing in the high-performance CPU arena again, Intel is willing to stop holding back. Skylake-X offers up to 18C36T for enthusiasts, but for gamers the real action is Coffee Lake and the Core i7-8700K. It's the fastest CPU we've ever tested for gaming purposes, and for non-gaming tasks it's the biggest jump in generational performance we've seen from Intel since…well, since Core 2 Duo blasted AMD's Athlon 64 out of the water more than a decade ago. It's not the fastest CPU for every task—more cores still win out in many professional applications, so Ryzen 7, Threadripper, and Core i9 have a place—but for most people, the Core i7-8700K is as much CPU as you're likely to need this side of 2020.